Undersea 'Banging Sounds' Not From Sub, Argentine Navy Says : The Two-Way First reports of the sounds picked up by surface ships briefly raised hopes that the missing ARA San Juan, with 44 crew members, had been found. 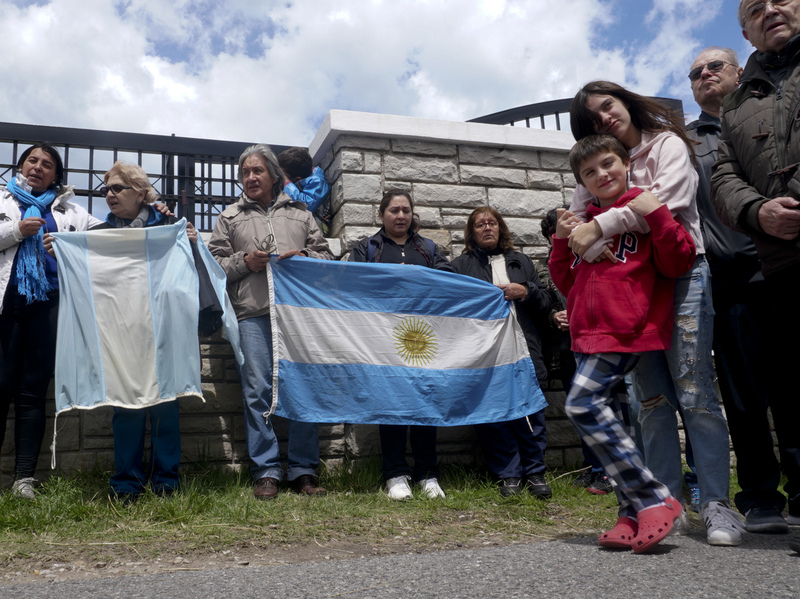 People gather outside the naval base in Mar del Plata, Argentina, on Monday, hoping for word on 44 crew members aboard the missing submarine ARA San Juan. There has been yet another false alarm in the search for an Argentine submarine with 44 crew members that's been missing for nearly a week. A hopeful sound picked up by two vessels running a search pattern near the sub's last known position was likely caused by a "biological" source — meaning a sea creature, not a submersible. NPR's Philip Reeves reports that the sound, detected by Argentine ships about 220 miles from the coast of Patagonia at a depth of about 650 feet, was first thought possibly to be made by crew members hammering on the sub's hull to attract attention. "We all had hope," Argentine navy spokesman Enrique Balbi said. "Some sources were saying that this was banging on the hull in Morse code signals." In fact, the sound does not correspond to a submarine, he said. Instead, "it may have been a noise from a living thing." The last confirmed signal from the submarine, ARA San Juan, was picked up on Wednesday – it was to report a problem. "The vessel surfaced and it reported a breakdown, which is why its [shore] command ordered it to return to base," naval commander Gabriel Galeazzi said. "A warship has a lot of backup systems, to allow it to move from one to another when there is a breakdown." Argentina and at least six other countries, including the United States, have dispatched ships and planes to the area to search for the German-built, diesel-electric powered submarine. Britain, with whom Argentina fought a losing war in 1982 for control of the Falkland Islands (which Argentina calls Isla Malvinas) dispatched HMS Protector to join the search flotilla. The submarine, one of three in the Argentine navy, was returning to its base from a routine patrol near the southern tip of South America to interdict illegal fishing when it suddenly went silent on Wednesday. As The New York Times reports, "From December to April, the high season for fishing, as many as 450 fishing boats from China, South Korea, Taiwan and Spain flock to the area to dredge up Argentine shortfin squid, said Milko Schwartzman, a marine conservation expert who has studied the trade. Illegal fishing in the area generates an estimated $1 billion per year, [Balbi] said." Stormy weather, with 26-foot waves in the frequently stormy South Atlantic Ocean, was hampering search efforts. Those conditions aren't expected to improve until at least Sunday. Over the weekend, officials said they believed they had received several truncated satellite phone calls from the submarine that they hoped could help pinpoint its location. But the navy later concluded the signals were unlikely to have come from the sub. The San Juan entered service in the Argentine navy in 1985 but underwent an extensive "midlife update" from 2008 to 2013 — a refit that was reportedly plagued by funding delays.